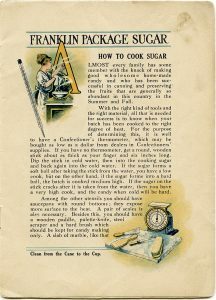 Here are two aged and shabby vintage cookbook pages that include images of a woman testing the temperature of heated sugar, a food scale set out with a marble board and candy-making tools, and a young lady in a blue and white plaid bonnet and apron carrying a basket filled with groceries. The pages also include instructions and tips for how to cook sugar for home-made candy. 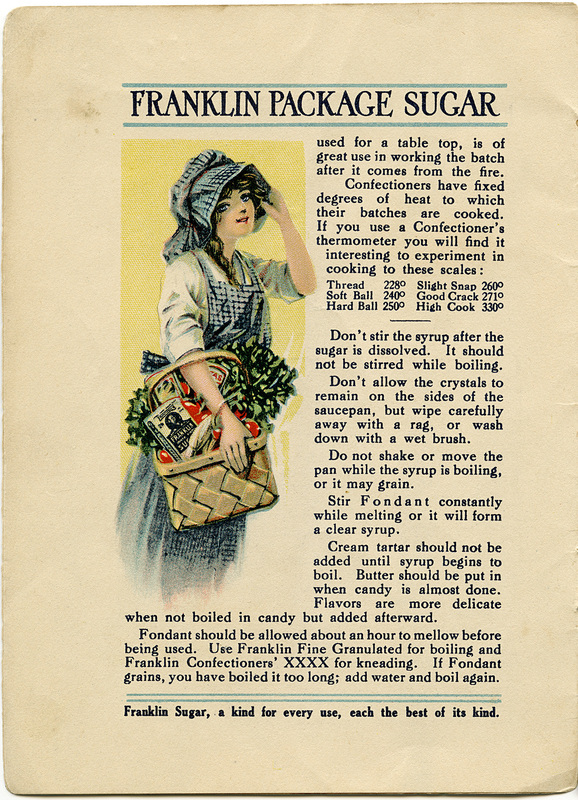 I scanned the original pages from a small advertising booklet titled Franklin Sugar Candy Book. 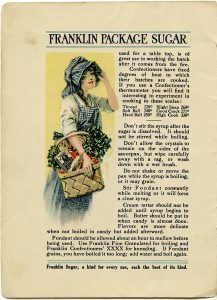 These Franklin Sugar pages are just delightful, and the advice is still good, as I can attest from recent batches of Christmas fudge-cooking. Thank you so much for showing us the charm and sincerity of by-gone women. I know it is a lot of work to find and process the graphics that you post here. What would we do without ye? Thanks so so much! Love these sugar images. Sharon, several of my family members and I enjoy baking but not one of us make fudge. I bet your homemade fudge is a big hit! Patricia. you’re welcome. I appreciate the feedback. Ros, the book is an antique, from the early 1900s, and it is very interesting, even though it’s only a small booklet and there are not many pages in it. Fudge is sometimes a big hit, sometimes not. It is a tricky process, and the exact temperature to which it is cooked is key to the texture of the finished product. Properly cooked fudge turns out creamy and smooth after only a few minutes of beating with a wooden spoon. Cooked too little, it is a stubborn sticky mess, cooked too much it becomes clunky shards. (We have a great Christmas story of my uncle dropping a platter of his fudge, breaking the platter but not the fudge.) Testing and judging the fudge by dripping the syrup into cold water until it forms a “soft ball” is pretty much my sole claim to cooking fame in this family. 🙂 The old Franklin Sugar pamphlet tells all you need to know! Plus sweet illustrations of a by-gone era.